I was away for 2 weeks and missed the horses a lot. I was delighted that they came up the day I returned. I was quite surprised to see how much taller Suki has gotten, but also he is getting much lighter in color. He won't be a black and white pinto...his black spots are turning more towards brown. He is just over 2 months old. A portrait of Suki, 10 days old. He looks a little tired !! Here he is quite a bit darker. Polka Dot and new Colt, "Suki," who was 10 days old when this photo was taken. It is one of my favorite photos of the pintos. 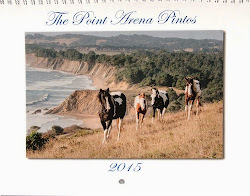 This site belongs to The Point Arena Pintos and we are delighted that you have taken the time to visit our blog! These pintos are wild and except for the older mare, Lady, they have not been use to human contact and have had very little care. For many years they have survived solely on wild grass and a spring for water. The purpose of this blog is to share their story with you and to raise money for their upkeep. I will be posting photos and updates about the horses regularly. "Thunder, Mama, pregnant Polka Dot, Little One, and Sweetie." For this first blog I will give you a little history. About 2 years ago I woke up in the middle of the night and heard neighing and discovered that there were a bunch of horses outside my window! I had seen these pintos for some time on the hill next to our property -from afar they looked iconic and majestic. It turns out the fence was/is down that connects their home to ours. I could not find the owner at that time as he was living out of the area, so I tried to fix the fence but to no avail. For the first year, on rare occasions, one or more of them would come to visit and graze. In the past year they started coming more often, especially Thunder the black and white stallion. He would stay awhile and check us out. Eventually he brought up all the others as you can see in the photo above. Over a period of time they started visiting regularly and I started feeding them carrots and later added alfalfa squares. Much to my delight except for Thunder, they will eat from our hands...it took about 3 months for all of them to trust us. Now they will eat carrots from my friends and family as well. Thunder is the only one who holds back, but much to his surprise he has taken a few carrots. It was quite a process learning more about their history and finding the owner. In the meantime, they started to adopt us; now they come over every day for treats and will stay all day, all night or for a short period. We never know when they will show up but their appearance brings us joy! Not knowing if they had any names, I gave them names. 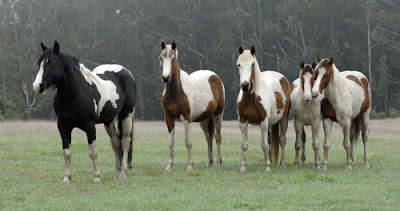 There are 3 mares - Polka Dot, Lady over 30 years old, and Mama; 3 stallions- Sweetie over 2 years old, Little One, about 2 and Thunder 18, the black and white one and the head stallion. By watching their behavior I have determined that Lady is the mother of Sweetie and Mama is the mother of Little One. Last July much to our delight a colt was born "Suki," his parents are Thunder and Polka Dot. I finally met with the owner and he has given me written permission to photograph them and put them on the internet. He is no longer in a position to care for them and we would like to officially adopt them. Before we can do this, we need to come up with the funds for a vet and to build a fence and a corral. Living in a small town, I heard all kinds of rumors about these horses. From different sources and the owner, I have pieced together their story. 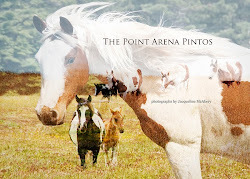 The owner originally raised minature horses and his wife had the pintos. The wife eventually moved to Europe taking most of the pintos with her. The remaining pintos were left to roam free on lots of land. My understanding is that the parents and/or grandparents of Thunder were registered paints. Unfortunately, it is no longer possible to get ahold of the registration papers and so Thunder and the rest of the pintos cannot be registerd. They come from solid stock that has been in this country for many generations. Three of the horses have one blue eye and one brown eye, which is genetic and quite common with pintos. 3)Vist this blog frequently for updates and more photos.